Omerta: City of Gangsters is a complicated game with many interesting facets set in a prohibition era Atlantic City. While we loved the setting, the strategy, and what the game tries to do; the sum of the pieces seemed to miss being a cohesive whole. The biggest complaint our reviewer had was related to the game's combat system, they found it a bit frustrating and shallow at times. Luckily it seems developer Haemimont have heard fan feedback and is preparing a major patch for the game. Economy overview panel for current businesses with their efficiency, profit, ect. Hopefully the multiplayer map updates will include some new co-op maps. The update should be available in 4-8 weeks. While you're waiting, you can check out a demo for the game on Xbox 360. The demo showcases two levels from the game and gives you a glimpse into both the city strategy and turn based combat it provides. 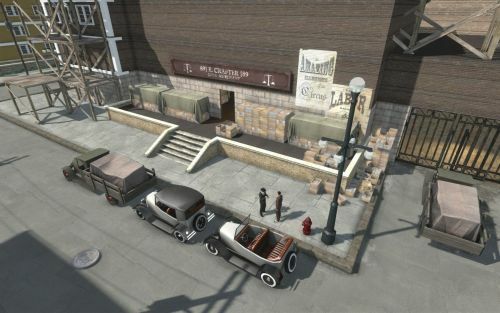 Omerta: City of Gangsters is available now on Xbox 360 and PC. It features two player online co-op through a separate set of challenge missions. Page created in 0.5242 seconds.